As nanotech applications become more diverse, the need for reliable vibration control has become increasingly critical. By David L Platus, PhD, Founder, Minus K Technology, Inc. It wasn't too long ago that deciding where to locate your scanning probe microscope was a simple endeavor: put it in the basement where the ambient vibration is minimized. But now, with nanotechnology applications growing exponentially, scientists and engineers are putting their equipment in a multitude of locations where vibration noise is significantly high. Scanning probe microscopes, interferometers and stylus profilers are being sited in locations that pose a serious challenge to vibration isolation. Many companies, such as Ambios, a manufacturer of SPMs, stylus profilers and optical interferometers, are now specifying negative-stiffness isolators. Additionally, in an effort to keep nano-equipment costs as low as possible by cutting out the peripherals, many academics and industries are not adequately providing for vibration isolation on the ultrasensitive nano-equipment that they are putting into their facilities. Although high-budget installations (valued in the vicinity of hundreds of thousands of dollars) typically incorporate adequate vibration isolation, (this is not the case with many lesser-budget set-ups (those spending under $120,000 for equipment), which represents the area of most rapid growth in the nanotechnology universe. It is estimated that 40 to 5O percent of these sites, in both academia and industry, are initiated with inadequate vibration isolation. This is influenced to some degree by the fact that those specifying nano-equipment do not always fully grasp the extreme sensitivity of the instruments and that they require proper site selection and vibration isolation. With any type of microscope or other nano-instrument, even a high-powered optical microscope, noise isolation must be a priority or diffused and fuzzy imaging-or sometimes no image at all-could result, causing reduced curability of a facility's nano-equipment. Unlike when purchasing bigger scanning electron and transmission electron microscopes, people aren't really focused on vibration isolation when purchasing an instrument such as an atomic force microscope (AFM). 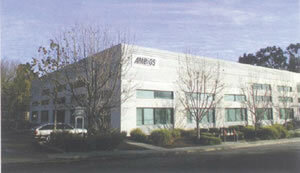 With smaller instruments, like white light interferometers, laser interferometers, stylus profilers, and AFMs, adequate site preparation is often not conducted, despite the fact that the equipment may be located on the fourth floor of a building and, without isolation, will not function optimally. Negative-stiffness vibration isolation is becoming an increasingly popular choice in nanotechnology applications. Site technicians frequently blame their instrument system for the problem they are experiencing. Sometimes, however, no system will work properly. They must first solve the noise problem, and that means incorporating some sort of mechanical isolation. Vibrations are usually very subtle. Even minute disturbances, which cannot be felt with your hands or feet, can cause considerable noise and interference to an AFM or interferometer. Within the facility itself, many things can create vibrations, such as the heating and ventilation system, fans, pumps that are not properly isolated, and elevators. These mechanical devices create a tremendous amount of Vibration in the building and depending on how far away the instruments are from it, they may or may not be adversely affected. Equipment can also be influenced by vibrations external to the building, such as from adjacent traffic, wind, construction, and other elements. These internal and external influences cause lower frequency vibrations, which raise havoc with nano-instrumentation. Wind blowing, for example, can cause a substantial resonance, and a train near the building can cause movement in the cement slab-perhaps unperceivable to a bystander, but for instrumentation, it can have disastrous consequences. In the early years of nanotechnology, research scientists were fond of suspending their very expensive AFMs on bungee cords hanging from the ceiling, thus sustaining acceptable vibration isolation. Although a few are still employing this technique, many scientists are no longer willing to take that risk and have switched over to other isolation systems. One such system is known as active isolation, or electronic force cancellation. It uses electronics to sense motion and then electronically puts in equal amounts of motion to compensate, effectively canceling it out. The efficiency of this method is adequate for application with the latest nanotechnology, as it can start isolating frequencies as low as 0.7 Hz, which is sufficient to protect from the lower frequencies that are so damaging to image clarity with SPMs and interferometers. However, if you can isolate your equipment mechanically without having to rely on some form of supplied energy then you can avoid electronic dysfunctions and power modulations, which can interrupt scanning. Negative-stiffness vibration isolation is becoming an increasingly popular choice in nanotechnology applications (see Fig. 1). Not only is it ii highly workable vibration solution, but the cost can be up to one-third the price of active systems. Negative-stiffness isolators employ a completely mechanical concept in low-frequency vibration isolation. Vertical-motion isolation is provided by a stiff spring that supports a weight load, combined with a negative-stiffness mechanism (NSM). The net vertical stiffness is made very low without affecting the static load-supporting capability of the spring. Beam columns connected in series with the vertical-motion isolator provide horizontal-motion isolation. The horizontal stiffness of the beam columns is reduced by the "beam-column effect," whereby a beam column behaves as a spring combined with an NSM. The result is a compact passive isolator capable of very low vertical and horizontal natural frequencies and very high internal structural frequencies. The isolators (adjusted to 0.5 Hz) achieve 93 percent isolation efficiency at 2 Hz; 99 percent at 5 Hz; and 99.7 percent at 10 Hz. What negative-stiffness isolators provide is really quite unique to the field of nanotechnology. 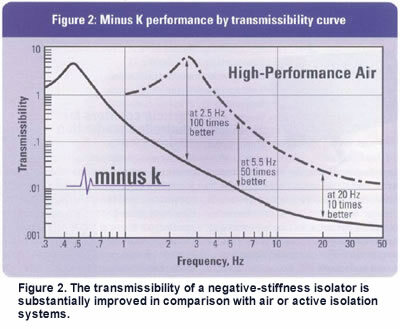 In particular, the transmissibility of a negative-stiffness isolator-that is, the vibration that transmits through the isolator as measured as a function of floor vibrations-is substantially improved in comparison with air or active isolation systems (see Fig. 2). Although active isolation systems fundamentally have no resonance, their transmissibility does not roll off as fast as that of negative-stiffness isolators. Thus, at building and seismic frequencies, the transmissibility of active isolators can be ten times greater than that of negative-stiffness isolators. Air isolators have the added disadvantage that their 2 to 2.5 Hz resonance effects a significant loss in isolation capability below about 5Hz. Dr. David L. Platus is president and founder, as well as the principal inventor, of the technology. He earned a BS and a PhD in engineering from UCLA and a diploma from the Oak Ridge School of (Nuclear) Reactor Technology. Prior to founding Minus K Technology, he worked in the nuclear, aerospace and defense industries, conducting and directing analysis and design projects in structural-mechanical systems. He became an independent consultant in 1988. Dr Platus holds over 20 patents related to shock and vibration isolation.